House Of Cards Built On Running LG Washing Machine! 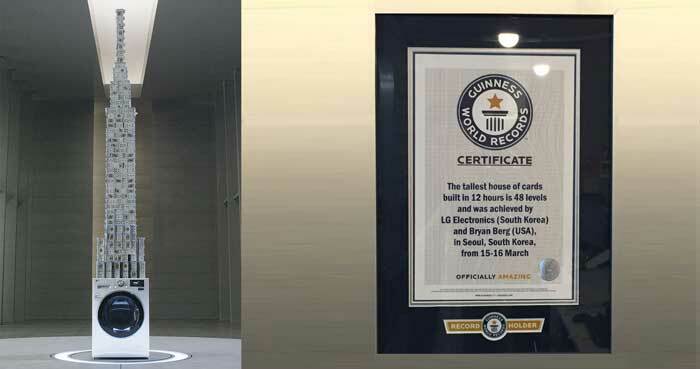 Professional card-stacker Bryan Berg (USA) teamed up with LG Electronics (South Korea) to promote the brand’s latest product and took on the challenge to create the Tallest house of cards built in 12 hours, on top of their new washing machine, while it was running at 1,000 RPM on April 20th 2016. With the construction measuring 3.3 m tall and comprising an incredible 48 levels. It was created to show that machine has significantly reduced vibrations.